A bright and vibrant classic springtime planted basket, a joy to receive as winter begins to fade and spring is just around the corner. 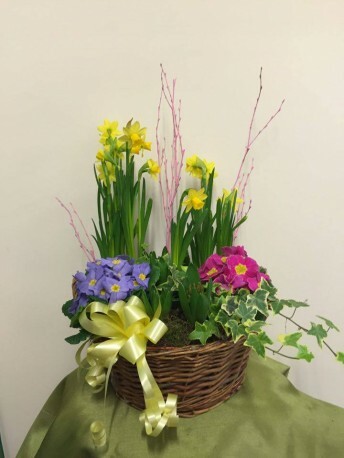 This colourfull collection includes the sweet fragrance of hyacinths, cheerful narcissus, and the stunning colour of primroses and lush green foliage all placed in a rustic country basket trimmed with a comlimentary ribbon. This planter is a gorgeous gift for many occasions and can also be placed outside in a sheltered spot for a splash of outdoor colour .Delivered in bud to ensure a longer life.Just add your special personal message. A perfect choice for many ocassions, available for deliveryfrom your local florist in Hereford and the surrounding area.